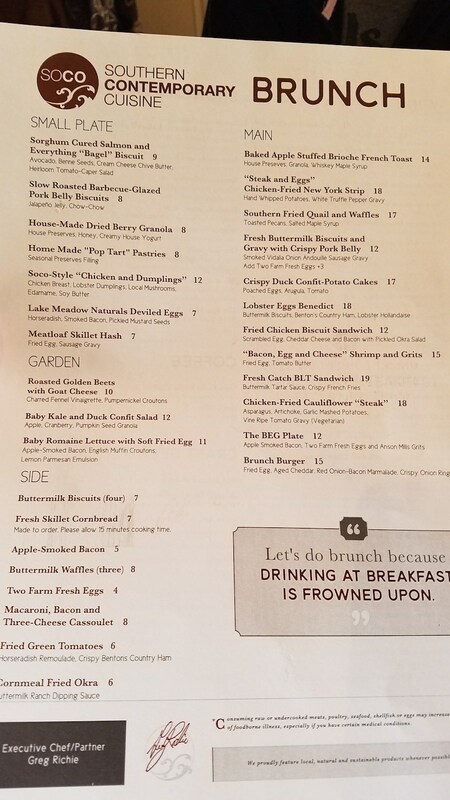 A Sunday Brunch Review of Soco Thornton Park - Is Brunch as Good as the Biscuit Taco Tuesday? This is a 100% honest, 100% authentic Soco Thornton Park restaurant review. Dadtography was not compensated in any way for this post. All images are unedited originals taken by Dadtography. Please don't use our photos without permission. My wife and I are probably like many parents - we love going to brunch but we just don't actually make the time to do it most weeks. 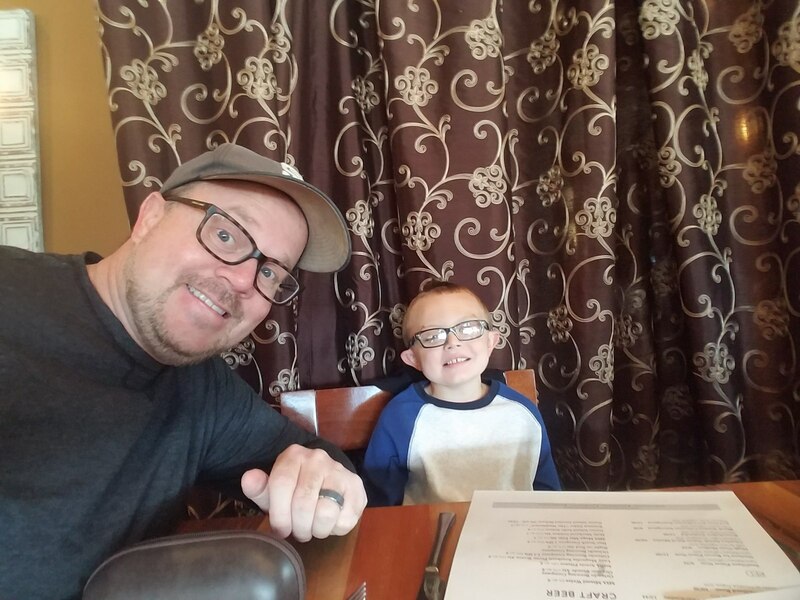 Sometimes our "date night" for the week is actually at Sunday brunch, and sometimes we bring the boy with us, too. We visited Soco Thornton Park in January, 2018 on one such Sunday brunch "date". We were looking for something close to the Farmer's Market at Lake Eola that would be kid friendly and had mimosas and Bloody Mary's. We found a great spot and will be returning ASAP. Here's our experience. Soco (short for Southern Contemporary Cuisine) Thornton Park is a downtown Orlando restaurant concept by chef Greg Richie. I don't really consider myself a "foodie" and I'm no chef groupie, but I've seriously become a fan of Greg Richie over the years. I've visited Soco a few times in the recent past, but mostly for happy hour and / or dinner. When I saw on my most recent dinner visit that they also offered a Sunday brunch, I HAD to try it out. My wife suggested we make a family brunch trip downtown so that we could have a nice meal and then walk around the Lake Eola Farmers Market. 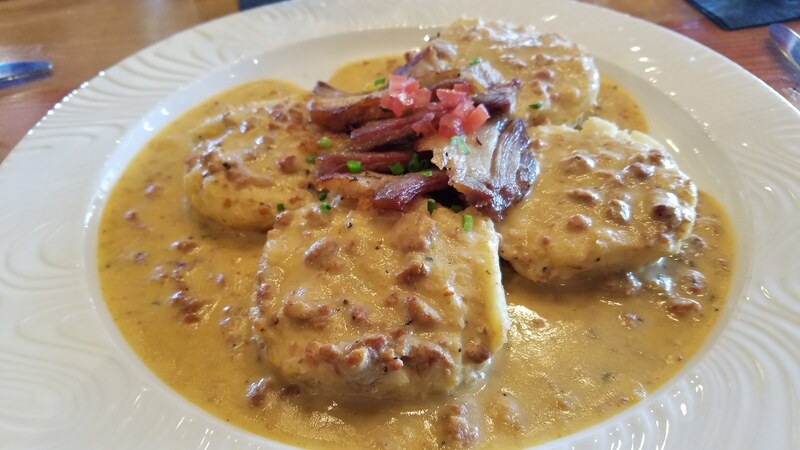 We originally headed out for a brunch location in the Ivanhoe district of North Orlando, but decided to hit up somewhere closer to the market. I'm glad we decided to divert, because our experience at Soco was probably our best brunch we've ever had - at least in recent memory. Everything about the experience was top-notch. The food was great, the service was awesome, there was no wait (on a busy, sunny Sunday around 11am). We couldn't have asked for more and can't wait to go back and try it again! How's the Soco location and atmosphere? The first thing you'll notice about Soco Thornton Park is the location. It's right smack dab in the heart of what's happening in Downtown Orlando. That can be both good and bad, especially on a busy Sunday morning. Brunch is a popular time of week for eating out to begin with. Combine that with the "buzz" that always is Downtown Orlando and the Farmers Market just a block away from Soco and you've landed at the hottest spot in town. We arrived at around 11am and were able to park in the Thornton Park garage (for a $5 fee) not far away. Street parking can be found, but it may be more difficult to come by. You won't find anything close, because of the Farmers Market, so bring some walking shoes if you choose not to park in the garage. Inside, Soco is all abuzz on a Sunday morning. The atmosphere inside Soco on a Sunday morning is great. The restaurant itself is beautiful. There's a ton of light and lots of people talking away. The noise didn't bother me - I knew we wouldn't have a quiet, intimate conversation. Soco has a few dining rooms along with a bar with high-top tables as well. We sat in the main / front dining room and really enjoyed where we sat. We gladly would have sat anywhere they put us, especially without a wait. Is the menu any good at Soco Thornton Park? Ok, let's dig into the Soco menu, shall we? I took a photo of the menu and posted it here. This was the menu from our visit in early January, 2018, but I'm sure it changes on occasion. Here's what we ordered at Soco (more on the food below). 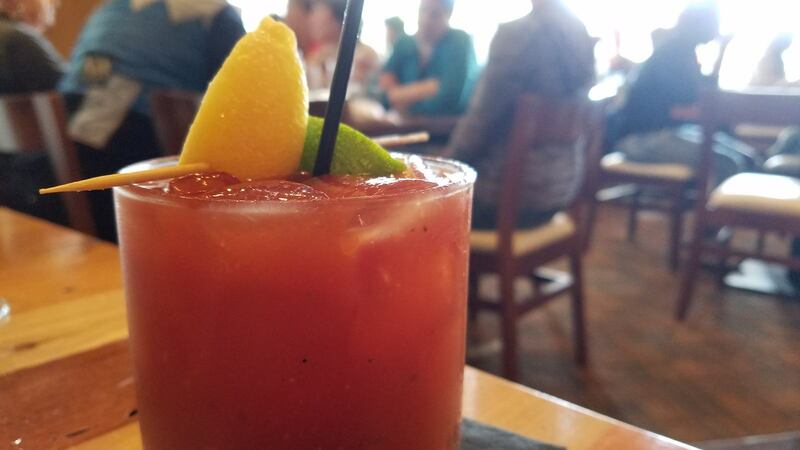 DRINKING AT BREAKFAST IS FROWNED UPON. One thing is for sure - the food will keep you coming back to Soco. First of all, it was really difficult to choose what I wanted to try. Everything looked so good and everything was new to me, so it took me a good bit of time to figure out what I wanted. My Bloody Mary took the edge off while I decided, at least. We ordered a few dishes and shared a few bites with each other. My boy had the buttermilk waffles and they were soooo good. They were crunch on the outside and soft on the inside. I've never had a waffle quite like it before. My wife ordered the Fried Chicken Biscuit Sandwich. It was a lot larger than we expected it would be. It was a bit difficult to eat as an actual sandwich, but it was definitely fork-and-knife worthy. We didn't mind having to use utensils in this case. The pickled okra salad that came with my wife's sandwich was surprisingly (not sure why we were surprised, tbh) good. It had great flavor and crunch and was served cold. I would gladly have this again. 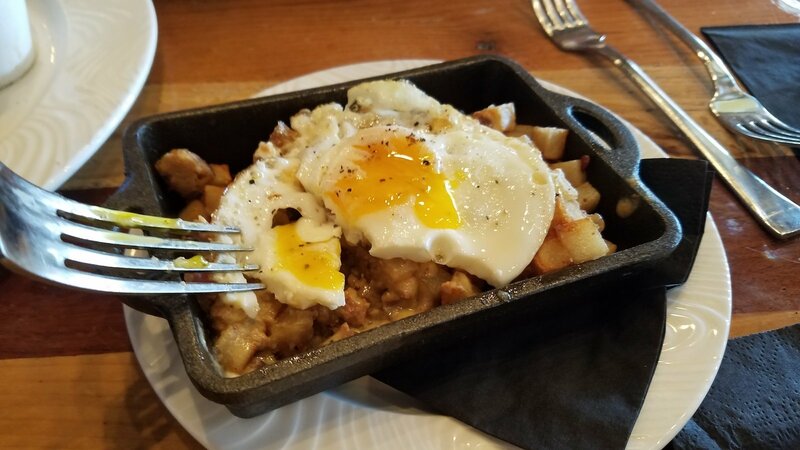 For myself, I ordered both the Meatloaf Skillet Hash as well as the Fresh Buttermilk Biscuits and Gravy with Crispy Pork Belly. I ordered both mostly because I couldn't decide on a single dish. Both were excellent. The skillet hash was just the right size, with not too much of any one ingredient. It had great balance and flavor. The biscuits and gravy were my favorite and were as good, if not better than the home-made version my wife makes from time to time at home. That says a lot because her breakfast is hard to beat. The staff at Soco Thornton Park clearly enjoy working there and it shows. Last, but certainly not least is the staff at Soco. We didn't actually meet chef Richie during this visit. We hope to on a future visit, for sure. We've (somewhat unknowingly) been a fan for some time now and it would be great to meet the man behind the goodness. Service at most restaurants is so hit or miss in Orlando. Some places have really great service, but many have absolutely terrible service. I think the service is usually more of a reflection on the establishment itself than the servers. 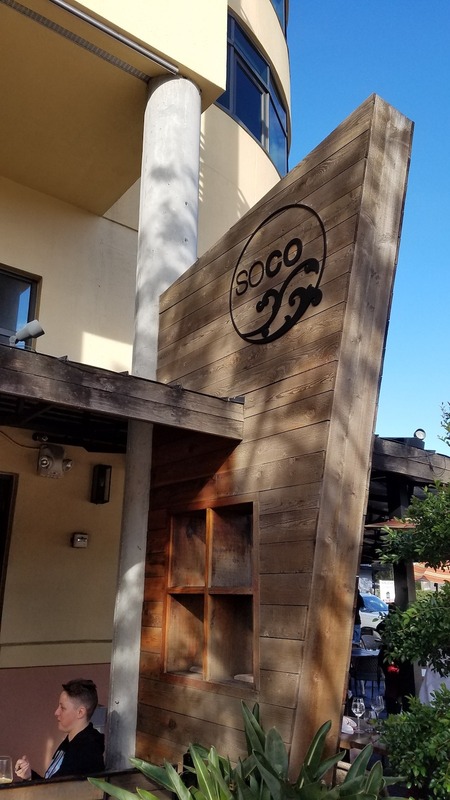 From the person that greeted us outside and opened the door for us to the duo at the desk and our server, we were impressed by the staff at Soco. The fact of the matter is, there's often little incentive for restaurant staff to work hard and be nice. They wake up early, stay late and work hard dealing with crowds, crabby guests and bad tippers. Props to Soco for clearly running an establishment that people are glad to be at. It shows in their service, without a doubt. What do you think? 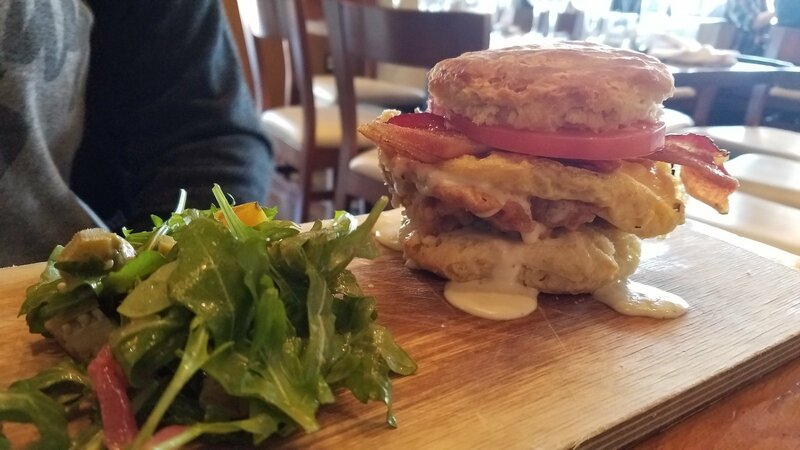 Have you visited Soco Restaurant in Thornton Park for brunch? Leave a comment below! Not the cheapest place in town for brunch.